Zombies, zombies, zombies. If there ever was a movie subgenre sorely in need of reinvention, it's the zombie film. Thanks to dozens of zombie themed video games, TV shows, comic books and movie remakes, the zombies marketplace has to be damn near saturation. With so many zombie stories being told, and all of them treading similar thematic ground, it's hard to imagine a property really redefining well worn tropes: Shoot zombies in the head to stop them; zombies are attracted to noise; bites transfer the zombie disease. That the biggest variation in zombie media is whether or not zombies will be the classic slow zombies (the reanimated dead) or the contemporary fast zombie (typically humans infected with a virus) is telling. World War Z attempts to shake up the zombie genre with another key difference. While most zombie movies depict a small, rag tag group of survivors, WWZ attempts to create a grandiose, globe-trotting zombie adventure film, not unlike the scale one might expect from an Indiana Jones or James Bond flick. In fact, the film is something of a mash-up of the two genres, with exotic locales and international intrigue. Only this time, government agents are running from the undead, rather than each other. Gerry Lane (Brad Pitt, Killing Them Softly) wakes up to a typical middle-American morning, cooking breakfast for his wife and two daughters. Little do they know it will be their last breakfast together at home. On their way to work and school, pandemonium breaks out in their hometown of Philadelphia. After a lengthy and harrowing escape, Gerry is contacted by his former boss at the UN. The world needs Gerry, a former UN investigator, to locate the origin of the disease and, potentially, lead surviving scientists to a cure. If Gerry plays ball, his family can stay on US Naval ships at sea, far from the infected mainland. If he doesn't, the Lanes are on their own. Gerry agrees of course, and jet sets across the world, locale to locale, action setpiece to action setpiece, looking for Patient Zero, the first infected. Highlights include escaping from zombie infected military outpost and zombie attacks on a commercial airliner. The final act demonstrates all of filmmaking's greatest haunted house tricks. PG-13 horror films are always curious beasts, this is no exception. Horror die hards will bemoan WWZ's lack of gore and intensity, though teenagers, horror newcomers, and anyone else not invested in the horror genre will likely be taken in by the jump scares and eerie zombie makeup. In the past, I have referred to effective, but un-harrowing horror films as "training horror films" and the description certainly applies here. World War Z was directed by Marc Forster (Quantum of Solace) based on a screenplay by Matthew Michael Carnahan, Drew Goddard (The Cabin in the Woods) and Damon Lindelof (Star Trek Into Darkness). Story credit goes to Carnahan and J. Michael Straczynski, while the World War Z property is based on a novel by Max Brooks. So many credited writers is generally a sign that the movie will be a mishmash of ideas and directions (read: crap), though World War Z holds up surprisingly well considering. 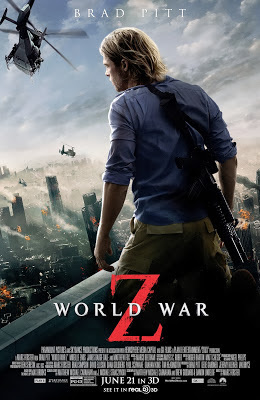 The brisk pace keeps the film involving though no one will ever look to World War Z as an involved character study or the pinnacle of zombie filmmaking. It doesn't reinvent the undead the way it wanted to but it's worth a look.